If you’re ever heading to Alleppey and want accommodation at a budget but still comfortable and clean, head to the Hotel Sea Breeze Beach Homestay, complete with the fabulous views and remote location. 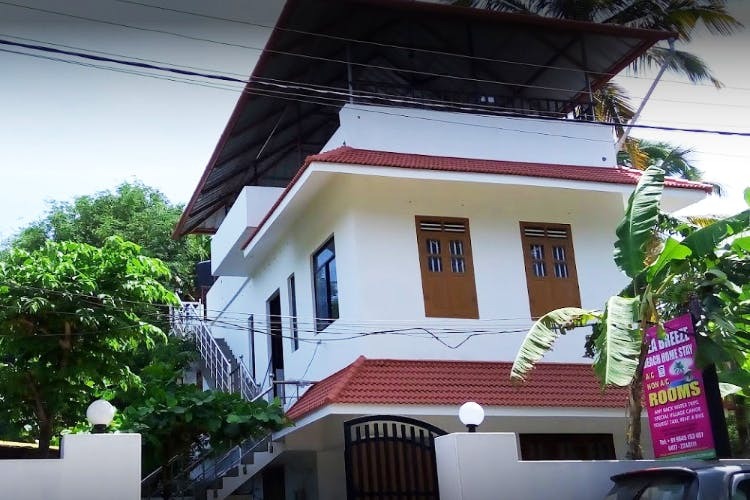 A minute’s walk away from the Allapuzha beach, the homestay is a small white house that has a few rooms where guests can stay and has a load of things to do around it. Not much of a looker from the outside, the homestay is perfect for backpackers, travelers and couples who aren’t looking to shell out a lot on accommodation and are looking to do a lot of activities and sightseeing around Alleppey. So this place is slowly checking all the boxes, one by one. There is a nice terrace, set up with a few chairs and tables, where you can enjoy the view of the surrounding areas as well as get a slight glimpse of the water around. It is a mix of convenience and comfort, with all religious, historical and chill spots near the hotel. There’s also free Wi-Fi, a kitchen where there is food available and you can also cook. There are 24-hour housekeeping services along with laundry services available. The hotel has twin and triple room options, all with attached bathrooms. Some have balconies and some don’t. The lowest you can book a room for is INR 700, which is a small twin room, with a balcony and attached bathroom. For larger rooms, they have triple sharing rooms that can be booked at INR 960. All rooms are provided with bed linen, bath linen and toiletries. There are also recreational activities here, including massages and boat tours also an option. Around the hotel is a lot of things to do. Hire a bike and ride down to the nearby attractions, including the Nehru trophy boat races, 4 kilometres away. Lazy day? Take a walk to the beach and soak up the sun and the sand. You could also go to Amaze World, an amusement park. Here, is a 9D theatre and loads of rides for kids. Check out the Revi Karuna Karan Memorial Museum, which hosts a family’s private collection including a bronze statue called the Prodigal Son. There are also crystal, ivory and procelain works. To eat, head to the Cafe Catamaran, located on the beach, serving for some relaxing beach side seating for a cool drink in Alleppey’s hot weather.